The Dragon Chronicles – Left-handed, Blond Capricorns, Untie! My daughter likes dragons. A couple of summers ago, we were vacationing in Myrtle Beach during the week of her birthday. After a morning of wandering around Alligator Adventure (the self-proclaimed reptile capital of the world! ), we found ourselves in one of those little mystical shops that sells things like jewel-encrusted swords, healing crystals, and of course, dragon figurines. Megan saw this guy over here —-> and decided that she had to have him. Flash forward several months. Maybe a year. I don’t know. Dinah, our resident Flying Squirrel (a.k.a. CAT) got into Megan’s bedroom, knocked the dragon from the bookshelf, and broke it in half. Flash forward again to a few weeks ago. I was cleaning my daughter’s hoarder-haven of a bedroom, and found that despite the fact that the dragon figurine had been long ago thrown away, she still had the box that it’d come in. 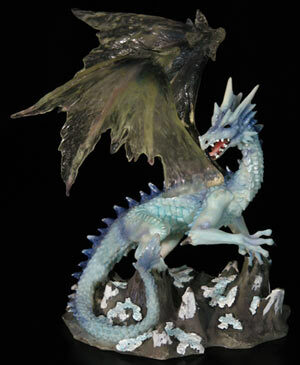 Always hard-pressed to come up with Christmas gift ideas for my daughter – she has Asperger’s Syndrome, so if it’s not something she has specifically asked for, you never know if she’s going to love it or show absolutely no interest in it whatsoever – I thought that trying to replace the dragon might be a good idea. Little did I know how hard it would be! From the box, I was able to determine the series and the name of the dragon in question. I googled – what on earth did we DO before Google??? – and found a few possibilities. I found a website that had the dragon at a decent price for a reasonable shipping cost, and placed my order. Woohoo! First Christmas present of the year purchased! Yay me! I then set about trying to come up with some more equally great gift ideas. A few days later, when I should have been receiving an email telling me that my order had shipped, I instead received one stating that my PayPal account had been refunded. What?!? Further investigation revealed that my order had been canceled because the item in question was on backorder. Back to the drawing board. Another search revealed the website for a small store somewhere in Massachusetts that not only carried the figurine, but had it priced for $5 less than the original site! YES! It was meant to be! I quickly placed my order, glad now that my original attempt had been thwarted. Two hours later, I received an apologetic email from the store owner. She had been preparing my item for shipping, and had opened the box to check it, only to find that the dragon was broken in half inside the box. It was the only one of that particular style in stock. Curses! Foiled again! Not sure at this point if this was going to be a case of “third time’s a charm” or “three strikes and you’re out,” I nervously placed one last order in an attempt to buy my daughter this dragon. This last option was being offered through ebay, and the price plus shipping costs actually came to a slightly higher amount than the two previous stores, which is why I had avoided it until now. But wait – what’s this? During checkout, I saw that Bill Me Later (for more on Bill Me Later, see my next post, “Bill Me Never”) was running a special, and if you were a first time user of this service, you’d receive a $10 credit – making this the least expensive of my three attempts. FTW! I kept waiting for the other shoe to fall – that email telling me that the item had been damaged, stolen, burned in a fire, abducted by aliens – but instead, I received notification that my order had SHIPPED! A few days later, it arrived, safe and sound, and now sits nestled in the depths of my closet, waiting for Christmas to arrive. WHEW!